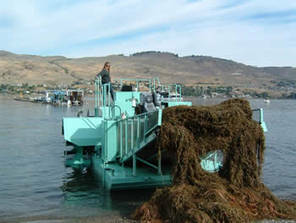 The current Eurasian watermilfoil control program, methods, machinery and techniques were developed by the BC Ministry of Environment in cooperation with OBWB staff. Several factors were considered during program development, including environmental concerns, public acceptability of control methods, effectiveness of control methods, weed re-growth densities, financial constraints, and local government needs and priorities. The current program includes rototilling in the late fall and winter and harvesting in the summer. 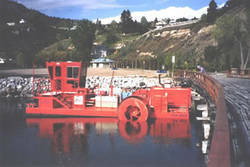 Rototilling is a mechanical control method whereby rototiller blades physically remove the roots of the plant from the bottom sediments of the lake. It is also referred to as de-rooting. Rototilling minimizes interference with water recreation, reduces the spread of viable plant fragments, and eliminates the need to dispose of plant material. Harvesting involves cutting the Eurasian watermilfoil plants at a depth of two metres below the surface. Harvesting takes place in the height of growing season when plant growth has reached the surface and is much faster than rototilling, but can interfere with recreation and requires disposal of the cut plant material.